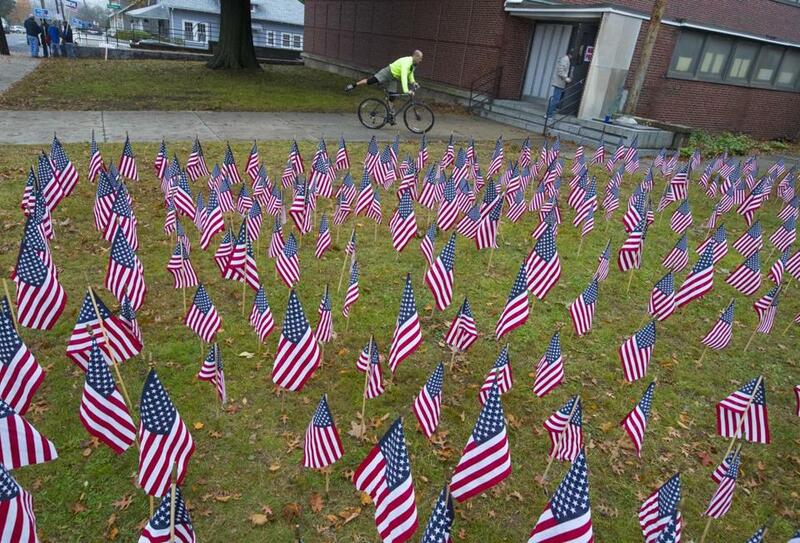 A voter on a bicycle hurries in to cast his vote at the Squantum Elementary School in Quincy. Voters in several states — including Massachusetts — voiced their opinions Tuesday on marijuana ballot initiatives, ranging from legalization to potential restrictions on cannabis shops in town. In Newton, the voters chose to keep the law as is, but in many states and municipalities, Tuesday’s results will bring far-reaching changes to their state’s marijuana industry. In Newton, voters rejected two ballot questions that would have banned or limited marijuana shops from opening in the city. One question asked voters whether they supported a ban on pot retailers in Newton entirely, and the other question asked whether they wanted to limit the number of pot retailers that could open. Both questions were non-binding, and both failed. As of Wednesday morning, with all precincts reporting, about 54 percent of voters had voted against the ban on marijuana shops, and about 53 percent had voted against limiting them. Because voters chose not to add any restrictions, the state law will remain as it currently stands, allowing the city to have up to eight retail marijuana stores. Michigan is the only state that legalized recreational marijuana Tuesday, and it is the first state in the Midwest to do so. There are now 10 states, along with Washington, D.C., that have legalized recreational marijuana. The law in Michigan takes effect in about one month. At that point, using and possessing marijuana will be legal, but, like Massachusetts, it could take a couple years to establish a system for retail businesses. Supporters of the marijuana ballot measure in Michigan expect legalization to bring in about $130 million more in tax revenue each year. North Dakota also had a ballot measure for recreational marijuana legalization, but it did not pass. The initiative failed with about 59 percent voting against legalization and about 40 percent voting in favor, with all precincts reporting by Wednesday morning, according to the North Dakota Secretary of State’s website. Sioux County, which lies within the Standing Rock Reservation, had the highest percentage of votes in favor of the proposal, with about 71 percent voting in favor of legalization. Voters in Missouri passed medical marijuana, but their ballot was particularly unique. Instead of one ballot initiative to legalize marijuana, there were three — each with different marijuana sales tax percentages and allocating that tax revenue to different locations. The measure that ultimately passed was a constitutional amendment that legalized medicinal marijuana, set the tax rate for marijuana sales at 4 percent, and allocated the tax revenue to health care services for veterans. That measure passed with about 66 percent of voters approving it and about 34 percent voting against it, according to the Missouri Secretary of State’s website. Utah voters also approved medical marijuana — in a way. In other words, current Utah law allows medical marijuana only if “grown, processed, or sold” by the state, according to the sheet. 1) It allows for private facilities to be part of the growth and sales of medical cannabis. 2) It creates a process for people to become approved to use medical cannabis. Proposition No. 2 in Utah passed with about 53 percent of voters for the measure and about 47 percent against it. Municipalities in several other states also passed local marijuana measures for their cities, towns, or counties. In Ohio, five cities voted to decriminalize marijuana. In Wisconsin, voters in some areas were asked non-binding referendums on cannabis, and ultimately voted in favor of ending marijuana prohibition. And in Colorado, voters approved a change in the definition of hemp from a “constitutional definition to a statutory definition,” which passed with about 60 percent of the vote, according to the state’s Secretary of State website. RELATED: Take a closer look at the results of marijuana measures as they came in on Election Night. Material from the Associated Press and Marijuana Moment was used in this report. Felicia Gans can be reached at felicia.gans@globe.com. Follow her on Twitter @FeliciaGans.